Unless a solution is found soon, the seemingly remote Puerto Rico debt crisis will hit close to home for many Americans. Puerto Rico missed a debt payment of nearly $422 million on Monday, its third default since 2015. The island, officially a U.S. territory, has a crushing debt load of about $72 billion. And more debt trouble lurks just around the corner. Puerto Rico has a massive payment of $2 billion due July 1. That's when the ripples from the Puerto Rico debt crisis will start to reach the U.S. mainland. "The really bigger deadline is the one the market's more worried about, the July 1 payment," Peter Hayes, the head of BlackRock Inc.'s muni group, told Bloomberg. The July 1 payment includes $805 million in general obligation bonds, which are protected by the Puerto Rico constitution. If Puerto Rico doesn't pay, it will be the first default by a state-level borrower on general obligation bonds since 1933, when Arkansas did it. A July default might force a restructuring of Puerto Rico's general obligation bonds – all $13 billion worth. But you don't have to own Puerto Rico bonds directly for this to be a concern. 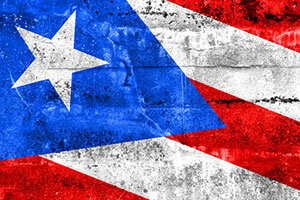 Many municipal bond funds, institutional investors – and yes, pension and retirement funds – loaded up on Puerto Rico bonds over the past decade. Individual investors could be exposed though these muni bond funds, or through pension funds that either bought Puerto Rico bonds or the muni bond funds that bought them. Pension funds in particular would be likely buyers. With interest rates at historic lows for years, they've been starved for yield. To ensure they can fund future payouts to retirees, pension funds typically shoot for annual returns of about 8% – a target increasingly difficult to hit. For such investors, Puerto Rico bonds would have been very tempting. They offered higher-than-average yields and triple-exemption status – meaning the income from the bonds is exempt from federal, state, and local taxes. And as government bonds, they were assumed to be safe. Now, as the Puerto Rico debt crisis unfolds, investors need to take a look at where they might be exposed to this risky debt. Approximately 44% of the 588 traditional municipal bonds funds in the United States have some exposure to Puerto Rico debt. Most of these have a relatively low amount, though, typically 1% or less of their holdings. But not Oppenheimer funds. Half of its 20 municipal bond funds have at least 15% of their holdings in Puerto Rico debt. And Oppenheimer funds make up nine out of the 10 muni bond funds with the most exposure to Puerto Rico debt. Two of those are unusually heavy with Puerto Rico debt. The Oppenheimer Rochester MD Municipal A fund (MUTF: ORMDX) has 42.6% of its portfolio in Puerto Rico debt; the Oppenheimer Rochester VA Municipal A fund (MUTF: ORVAX) has 39.29%. And while most muni fund managers have spent the last year or so trying to reduce their exposure to the Puerto Rico debt crisis, Oppenheimer has done the opposite. A year ago the portion of Puerto Rico debt in the Rochester MD fund was 36.9%; in the Rochester VA fund it was 33.8%. Both have paid the price. Returns last year for the Rochester MD fund were in the bottom 6% among its peers. And the Rochester VA fund had the worst loss of any muni mutual fund. So when seeking your own exposure to Puerto Rico debt, be sure to check for Oppenheimer funds first. The fund with the most Puerto Rico exposure as of Q1 was the Franklin Templeton Double Tax-Free Income Fund Class A (MUTF: FPRTX). But it has since merged with the Franklin High Yield Tax-Free Income Fund (MUTF: FRHIX), presumably to reduce its 44.72% exposure to Puerto Rico debt. Some other muni bond mutual funds with relatively high exposure to Puerto Rico debt include Eaton Vance Oregon Municipal Income (MUTF: ETORX) with 9.31%, MainStay Tax-Free Bond (MUTF: MKINX) with 8.8%, and the Wells Fargo Wisconsin Tax-Free Fund Class A (MUTF: WWTFX) with 7.94%. Funds with a lot of exposure to Puerto Rico have already fallen in value. Investors won't get back the bonds' full value, as the island is economically crippled and simply can't pay what it owes. What Puerto Rico needs is a restructuring of its debt. The problem there is that an obscure law prevents Puerto Rico from using Chapter 9 bankruptcy as Detroit did. That's something Congress screwed up, and so Congress can fix it. But lawmakers have been hamstrung by infighting and political maneuvering. The $2 billion July payment might provide the needed incentive to act, however. A bailout is very unlikely, but Congress is already considering a bill that would allow for a restructuring. For investors, that likely will mean a haircut, though not a total loss. The size of the loss will vary with the type of bond involved (Puerto Rico has sold more than a dozen different kinds of bonds). Last month, Puerto Rico proposed that non-Puerto Rico residents who own general obligation bonds would get $0.74 on the dollar, while bonds backed by sales taxes would get $0.54 on the dollar, and owners of General Development Bank bonds would get $0.36 on the dollar. The Bottom Line: The average investor in the United States may well have exposure to the Puerto Rico debt crisis. If not directly, then through a pension or retirement fund. And the $422 million missed payment this week isn't the end – it's just a taste of more to come. That's why investors need to check now to see if any of their money, especially retirement money, is connected to Puerto Rico. Congress will be forced to act when a $2 billion payment comes due on July 1, and the result will almost surely be a haircut for investors.